Powered with 4 inch touch screen, single touch 5MP primary camera, Karbonn A6 price in India is Rs. 5, 189 (best online price, close to Karbonn A7 price). Karbonn A6 price in India for retail stores may be around Rs. 5,500 which will vary slightly from city to city. Karbonn A6 features include Bluetooth for sharing files, Wi-Fi for accessing wireless internet, dual SIM on both 2G and 3G network and just 104MB of internal memory for storing only select files and records. 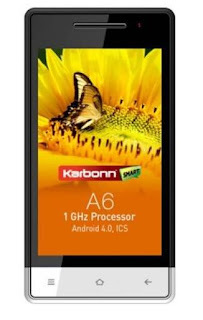 Karbonn A6 specifications include 1,450 battery which is not so good and bar form design in black and white color model. Karbonn A6 price is meant to target 3G customers who wish to enjoy photography, connectivity and other services on their smartphone. Karbonn A6 features 4 inch touch screen with resolution of 480x480 pixels (quite unique than rectangular shapes) which can be considered good in this range of smartphone. The smartphone has 5MP of primary camera which is really going to be surprise for its users and also it has 0.3MP secondary camera for video chatting. Karbonn A6 has just 104MP of internal memory (expandable up to 32GB) which is slightly lower though it has satisfactory 512MB of RAM and 1GHz processor which will ensure good speed when working on light to medium type of applications. Karbonn A6 specifications include Li-Ion type battery with capacity of 1,450 which offers talk time of 3.5 hours only on 2G/3G network services which is major issue with this smartphone though it has 250 hours of stand by time. The smartphone is available beautiful color combination of black and white colors in bar form which makes it even more attractive. Karbonn A6 has overall dimensions of 128 x 65.7 x 11.6 mm which is average in thickness (11.6 cms) and seems average in weight as well. Karbonn A6 price is well justified for its screen, connectivity and camera features which shall make this smartphone popular among students and entry level professionals also. Karbonn A6 drawback comes in the form of very low battery support and limited internal memory.